Day #2 of colouring challenge by Kathy @ TheDailyMarker.com. I coloured some succulents and cacti from Taylored Expressions using Polychromos pencils last night. And today I made the card using those coloured images. 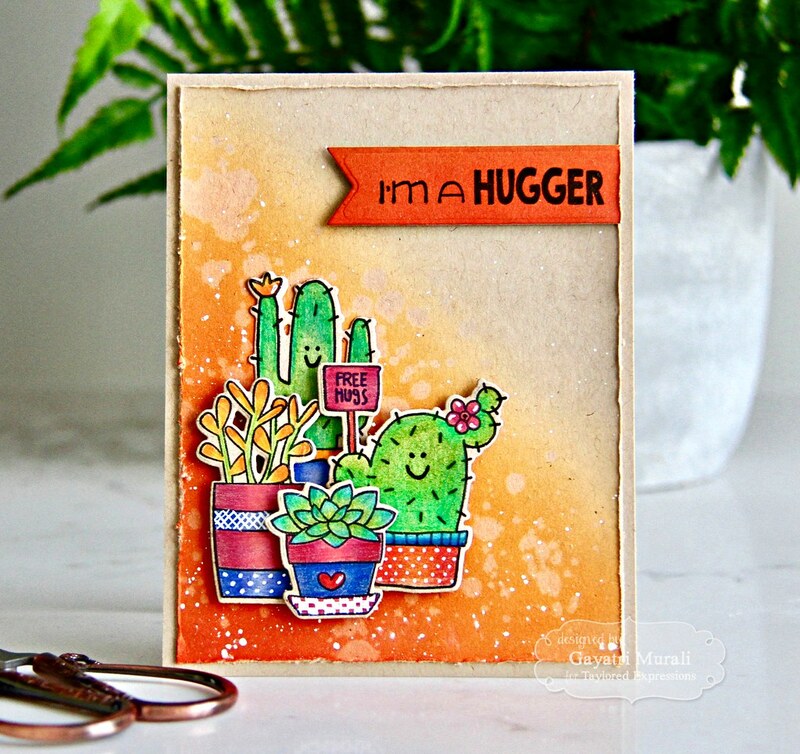 I stamped the succulent and cacti images from Simply Succulents stamp and die combo and Lookin’ Sharp stamp and die combo from Taylored Expressions on TE Toffee cardstock using Versafine Onyx Black ink. Then I used the dies from both the stamp set combo and die cut the images. I used Sakura white gel pen and black glaze pen to add interest and details to the die cut coloured images. For the background, I sponged Wild Honey, Spiced Marmalade, Ripe Persimmon and Candied Apple on the bottom left corner of a TE Toffee cardstock panel. I then trimmed the panel to 4″x5.25″ and roughed the edges. I spattered water and copic opaque white on the panel and adhered the panel to the TE Toffee card base. 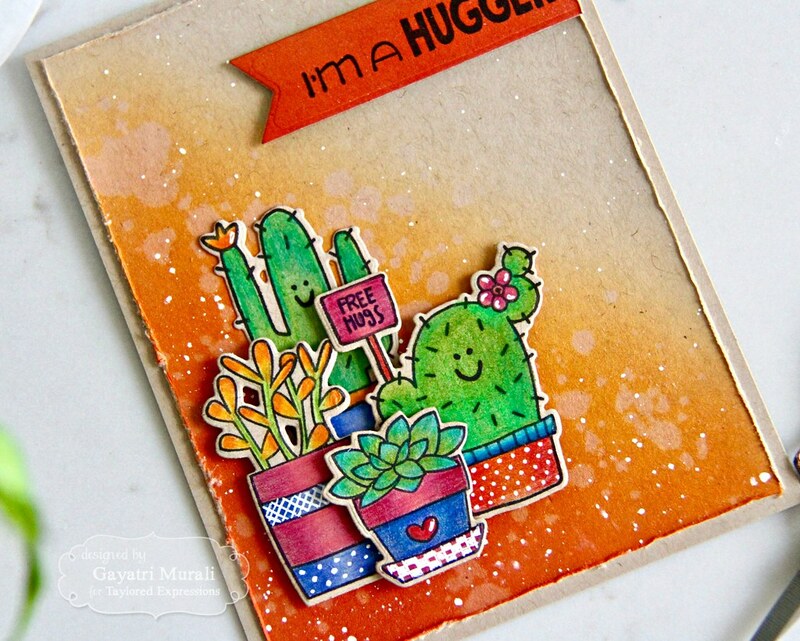 I clustered the coloured die cut succulents and cacti and adhered on the sponged area. Some of the die cuts are adhered flush, some foam and one double foamed. 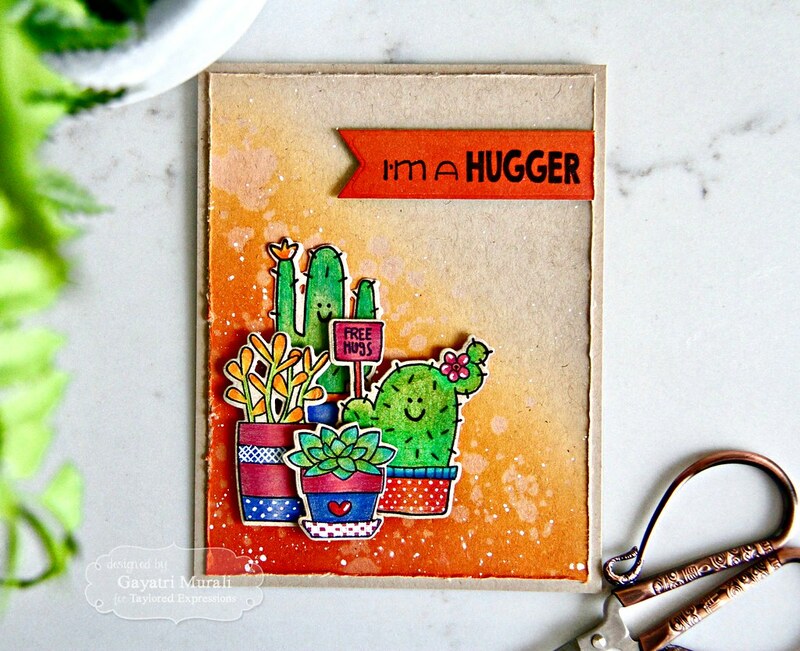 I sponged a piece of TE Toffee cardstock with ripe Persimmion and Candied Apple distress inks, then stamped the sentiment from Lookin’ Sharp stamp and die combo and die cut using second of Double Ended Flag Stacklets. I trimmed off the edge on the right side, roughed the edges and adhered this sentiment strip on the top right corner. No embellishments on the card. 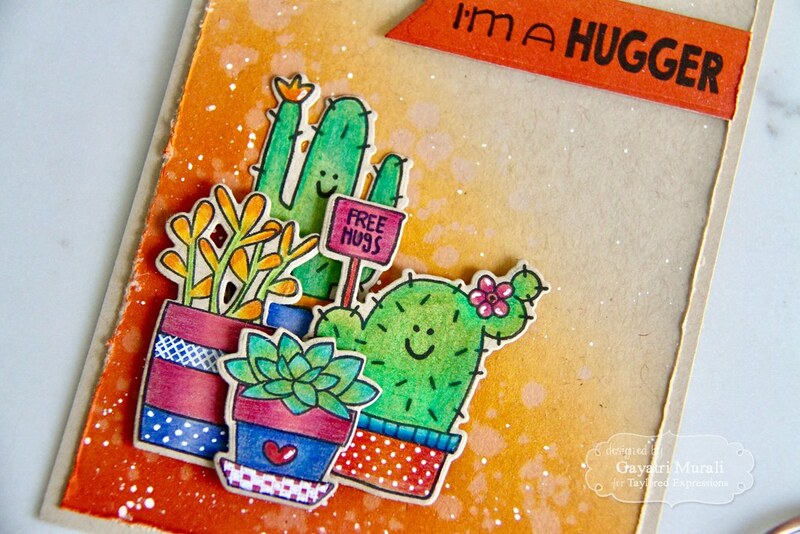 Here is my thought process for the choice of colours and texture on the card: I want the rough edges and the dessert colours to go with the cacti and succulents die cuts. The sentiment is very opposite to the roughness of the card. I like that. 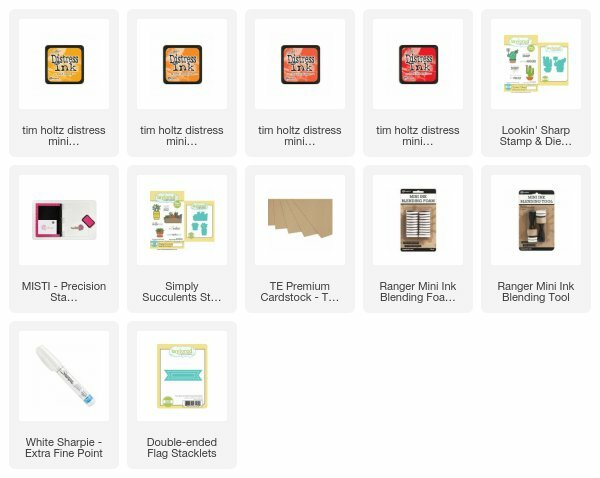 All the TE supplies used to make this card are listed below. Thanks for coming by today. I have one more post coming today. Stay tuned. Love this card, Gayatri. Thanks for the step-by-step on how you made this card.